We regretfully confirm that Theme Park Adventure is no longer associated with ScareLA Halloween convention in any way. We are unable to answer any questions about the convention’s current operations or future plans, nor are we going to make any further statement at this time regarding the extremely difficult decision we’ve made to resign as two of the event’s producers. We appreciate the support of the haunt community, and will always be incredibly proud of what we accomplished as a team over the past three years. Sadly, that has come to an end, and we are just as disappointed about that as our friends throughout the industry are. Thank you all for the outpouring of love and strength during this extremely challenging transition. We promise that we have not abandoned this great community, nor are we fading away. Theme Park Adventure is stronger than ever before, and remains dedicated to the Southern California haunt community and beyond. We are family. Always have been, always will be. 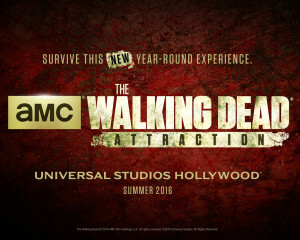 Universal Studios Hollywood brings the most popular show in cable television history to life in Summer 2016 when AMC’s Golden Globe award-nominated television series, The Walking Dead, sets up permanent residency at The Entertainment Capital of L.A. in an all-new immersive, cutting-edge attraction. Universal Studios Hollywood has worked collaboratively with AMC’s The Walking Dead for years as a signature Halloween Horror Nights maze. This newly enhanced venture will take the highly sought-after experience from a seasonal, limited time offering to an authentic 365 day opportunity, raising the bar for themed walk-through attractions. Drunken Devil (formerly Drunken Devil Productions), a company based in Los Angeles with a focus on producing events in Downtown, is bringing a burlesque and magic variety show to Redline Bar in Downtown Los Angeles. This event marks the first production of Drunken Devil’s 2016 Season. 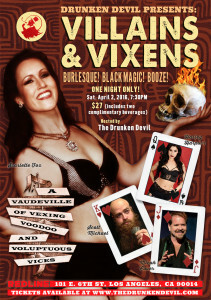 Entitled Villains & Vixens: A Vaudeville of Vexing Voodoo & Voluptuous Vices, this show will feature Drunken Devil alums Scarlette Fox (LA Sirenes) and Harley Harpurr (The Dollface Dames), performing a variety of seductive and sensual burlesque numbers, sure to delight and dazzle guests. In addition, magicians Micah Cover (The Magic Castle) and Scott Michael (Queen Mary’s Dark Harbor, Zombie Joe’s Underground Theatre) will bamboozle audiences with unbelievable feats of magic and mystery. The show, which features a bayou black magic/voodoo aesthetic, will be hosted by none other than the Drunken Devil himself. 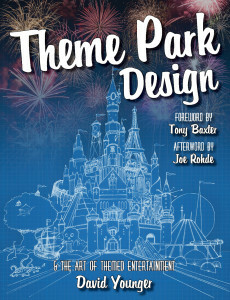 Want to design a theme park? Over the past century, theme parks have created worlds where pirates still loot Caribbean towns, where daring adventurers explore booby-trapped temples, and where superheroes swing from New York skyscrapers – and allowed us to step into them too. This is a book about how to design those fantastic places, and the ingenuity that goes into their creation. From the door knobs to the aged walls and textured flooring. From original merchandise to table tops in Three Broomsticks. These authentic details are an integral part to The Wizarding World of Harry Potter, and Supervising Art Director Alan Gilmore has a story to tell behind it all. 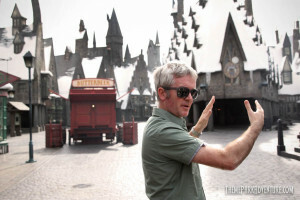 Gilmore worked on the Harry Potter films as an Art Director, and was brought on to work cohesively with Universal Creative to bring Hogsmeade to life and help translate the film design into a real place. “I’ve learned so much with them [Universal Creative]. It’s been a really fascinating journey for the last seven years with us working together,” Gilmore explained to a group of us as we walked together into the Wizarding World.